Goodness! I feel a bit rusty! LOL It's been a long time since I've posted one of my own recipes, but you all know that's because I've been working very hard on a beautiful cookbook to present to all of you! I threw this together so quickly the other night that I did not even stop to take pictures along the way! I apologize for that! 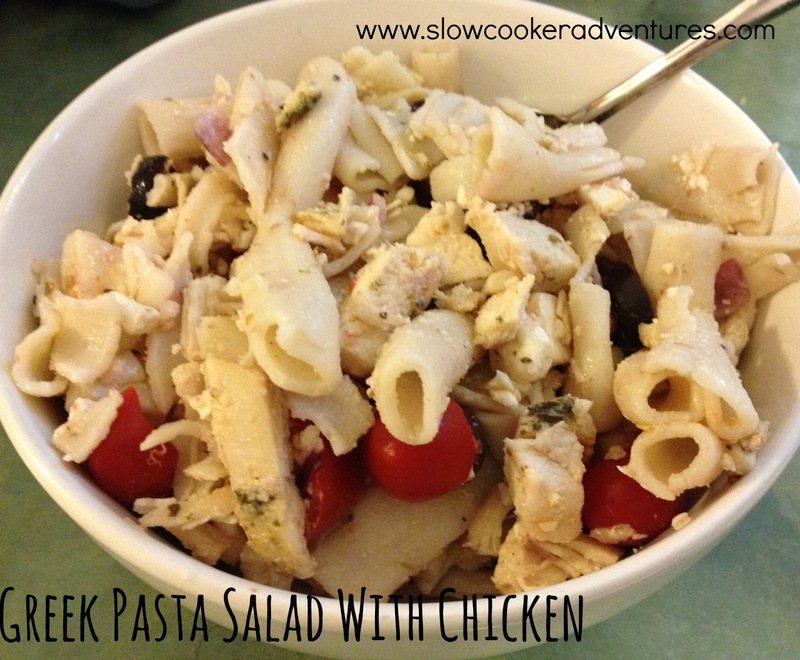 I don't know how Greek Pasta Salad popped into my head this week, but I'm so happy it did! I picked up all the ingredients at the grocery store this week and waited for the perfect night to make it......when I was extremely busy! That's because this recipe is really easy. So, let's get to it! In your slow cooker, place your boneless skinless chicken breasts and sprinkle with the Greek seasoning/rub. Pour the apple cider vinegar and water into your crock, around your chicken, trying not to "wash off" the seasoning! Cook on LOW for 5 hours, or on HIGH for 2.5 hours. When it is done, let it cool and cut it into bite-sized pieces. Cook your gluten-free pasta according to the package directions. Mix in about half of the Greek Dressing and set it in the fridge to cool for a couple hours. Once it's cooled, mix in the red onion, cherry tomatoes, feta, kalamata olives, the cooled chicken and the remaining Greek dressing. Stir it up, serve and ENJOY!